1. Mucosa, or mucous membrane (mu'kus mem'bran). This layer is formed of surface epithelium, underlying connective tissue (lamina propria), and a small amount of smooth muscle (muscularis mucosae). In some regions, it develops folds and tiny projections, which extend into the lumen of the digestive tube and increase its absorptive surface area. It may also contain glands that are tubular invaginations into which the lining cells secrete mucus and digestive enzymes. 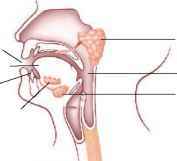 The mucosa protects the tissues beneath it and carries on secretion and absorption. 2. Submucosa. The submucosa contains considerable loose connective tissue as well as glands, blood vessels, lymphatic vessels, and nerves. 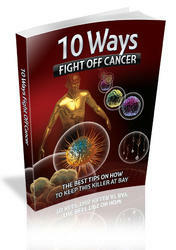 Its vessels nourish the surrounding tissues and carry away absorbed materials. 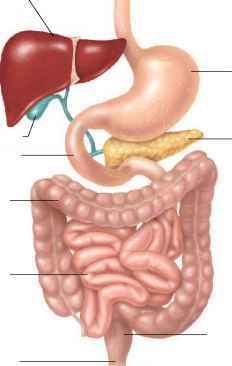 Major organs of the digestive system. muscular coat run lengthwise. When these longitudinal fibers (open spirals) contract, the tube shortens. 4. Serosa, or serous layer (se'rus la'er). 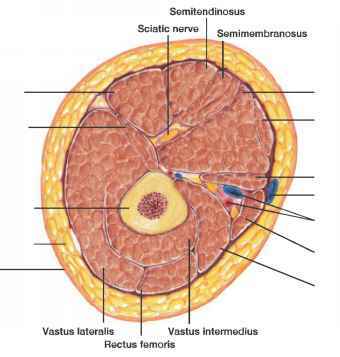 The serous layer, or outer covering of the tube, is composed of the visceral peritoneum, which is formed of epithelium on the outside and connective tissue beneath. The cells of the serosa protect underlying tissues and secrete serous fluid, which moistens and lubricates the tube's outer surface so that the organs within the abdominal cavity slide freely against one another. The motor functions of the alimentary canal are of two basic types—mixing movements and propelling movements (fig. 17.4). Mixing occurs when smooth muscles in small segments of the tube contract rhythmically. For example, when the stomach is full, waves of muscular contractions move along its wall from one end to the other. These waves occur every twenty seconds or so, and they mix foods with the digestive juices that the mucosa secretes. Propelling movements include a wavelike motion called peristalsis (per"i-stal'sis). When peristalsis occurs, a ring of contraction appears in the wall of the tube. At the same time, the muscular wall just ahead of the ring relaxes—a phenomenon called receptive relaxation. As the wave moves along, it pushes the tubular contents ahead of it. Peristalsis begins when food expands the tube. It causes the sounds that can be heard through a stethoscope applied to the abdominal wall. A device the size of a medicine capsule can image the alimentary canal, revealing blockages and sites of bleeding. The patient swallows the capsule, which contains a camera, a light source, radio transmitter, and batteries. About 6 hours later, it transmits images from digestive headquarters — the small intestine — to a device worn on the physician's belt. The information goes to a computer, and still or video images are downloaded. The device, which is disposable, leaves the body in the feces within a day or two. The "gi camera" is based on a device called a Heidelberg capsule used to monitor stomach acid. Soon to come is a capsule with longer-lasting batteries and better light to image the large intestine.